This past week we started our Fall Session of Music Together classes at Heartsong Music. Thank you, families, for a great start to our Fall Session. All of our teachers raved about their great classes and how happy they were to be singing and dancing with you all again. We have 10 teachers and over 600 children enrolled with over 500 families! It’s so exciting to be at Heartsong and hear each classroom bellowing out with music and song!! In my Monday 3:30pm class, I have mostly girls and many of them were 2, 3, and 4. Throughout our first class together, they were getting to know each other outside of our music making circle: galloping around the circle, dancing together doing their own movements together, or playing their egg shakers in their own corner… You get the idea. Because of my Montessori training, I was able to understand their needs for social relationships at that age so I did not take it personally, and I continued to have a blast making music with the moms! At one point in the class I mentioned the sensitive period all children go through for social relations (2.25 – 6.0 years old). You could have heard a pin drop and then a collective sigh of relief from the moms. Their thoughts were: “Oh, my daughter is doing what she needs to do to develop into a full person! Whew! !” One mom came up to me after class and said she was so relieved to find out about this sensitive period for social relations because her 3 year old has been asking to get together with friends every single day the last few weeks. Now the mom understands why. 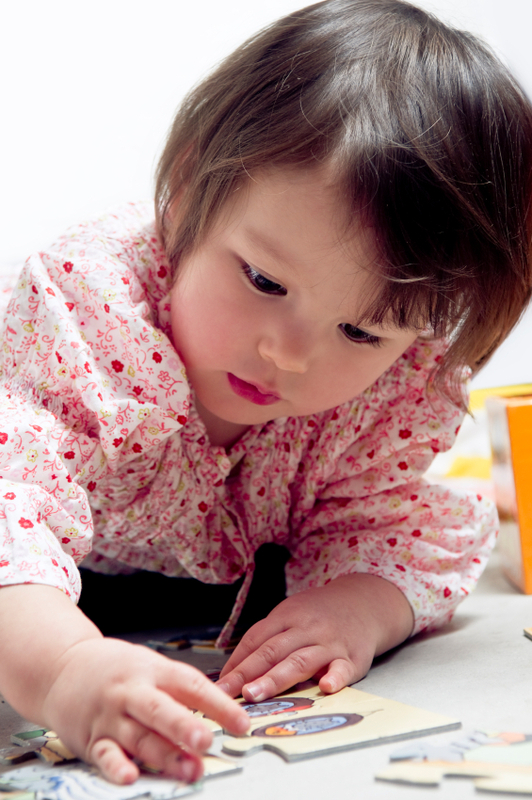 All children between 0 – 6 years old go through different “sensitive periods” according to Maria Montessori. These sensitive periods are universal for all children. They are also transitory, lasting only for a short time then they are gone. The sensitive periods overlap with each other. Each one is an irresistible impulse toward a well-defined activity, a burning intellectual love between the child and the environment. The child will focus on an activity without fatigue and for long periods of time. They only come for a moment, and if allowed to establish deeply within the child, it functions at a heightened level within the child and lasts for the child’s lifetime. For each sensitive period we miss, we lose an opportunity of perfecting this area in our development in some particular way – often forever! It is like a “dropped stitch” – the child will still grow into an adult but the area of development that was not established deeply within the child, may not reach it’s full potential. Small Objects – 1.25 – 2.25 years old. The child has an interest in almost invisible objects. Will bring you the tiniest items off the carpet with great pride and wonder! Loves small manipulatives: pasting, necklace making, sewing, and sorting. Notices the smallest details when cleaning, polishing, and sweeping. Social Relations – 2.25 – 6.0 years old. The child is interested in her own bodily actions. Good manners can be taught. The child is not self-conscious and is very willing to practice good manners. The child insists on doing things in the accustomed way – the right way. Refinement of the Senses – 0 – 3.75 years old. The child has a natural interest in sensorial impressions. Is very sensitive to qualities around self; can make distinctions with a clear perception of the senses. It is good to focus on one sense at a time: smells, touch, colors, hearing, tastes, work with dimensions for sight. Give your child as much sensorial experiences as possible at this age. Their senses are most heightened and open to exploration. The more they are exposed to at this age, the greater their ability will be to distinguish their senses for the rest of their life! For example, I wasn’t given much experience with colors as a young child. It is now very hard for me to tell what clothes go together or to distinguish between grades of the same color. In the Montessori classroom, the children could do this with ease. In our Music Together classes, just imagine the refinement of hearing that your child is getting by being exposed to the singing and harmonies taking place in class, exploring different rhythm instruments and the sounds they make, and when you sing to your child both in class and at home! Movement – 1 – 4 years old. This is the refinement of the gross motor skills of the whole body as well as fine motor skills of the hands, feet, legs, and arms. If the perfecting of movement and coordination is allowed, then the normal development of the mind occurs! It also will bring the child contentment, concentration, and inner nourishment. If the perfection of movement and coordination are not allowed, then the personality is out of balance; the child is less happy and is insecure. Maria Montessori says that movement IS learning and when perfected creates happy, content children. WOW!! I’m so thankful the children have so much movement, small and large, to explore in the Music Together classroom and then can take it all home and play with new movement ideas and make the movements their own. Since movement IS learning – it really is okay for children to move freely around the room whenever they are called by that deep need to get up and dance, move, gallop, toddle, crawl, wiggle and roll. Language – 0 – 5.25 years old. Language is the longest sensitive period because it is the hardest and most intricate to master. It is important for the child to master because it maintains the country’s spiritual unity. a. Infants and toddlers (0 – 2.5) are drawn to human sounds. The infant listens and the sounds make an imprint on the unconscious mind, so the child will be able to begin speaking and in an orderly way. b. 2.5 – 4.5 vocabulary is attached to the child’s experience. The child enjoys hearing the sounds of words broken down then built back up. For example, using the word “cat”, first you break it apart: “What is this word? “k” (make the sound), “a” (make this sound), “t” (make this sound).” The child then echoes those sounds, then slowly begins connecting the sounds together, and finally gets that it is the word “cat”. This is the precursor to reading. Great fun for all! c. 3.5 – 4.5 the child begins to write. Has an interest in the shapes of letters and learns that each has its own sound. This explodes into writing. d. 4.5 – 5.5 the child is writing and begins to read. We sing it in its entirety so the children can experience the song as a whole. Many songs have an A section and B section. To make this clearer for the children, we may do different activities or movements for each section. This adds visually to the differences between the A section and B section. The child can count on the same movements for the different sections. And in this way will begin to figure out how music and songs work. We sing a tonal pattern or chant a rhythm pattern after a song or chant to show children the basic building blocks for the song or chant. This helps the children understand how music works and gives the song or chant an orderly place to be catalogued in their minds. Language development using the words of the songs; listening to the teacher then following instructions; looking at the way music works in the songbook and “reading” along; using CDs at home and in the car to continue encouraging singing the words with the whole family participating together; then the ability to sing without the CD or the family members helping! What an achievement!! Movement through small finger plays, taps, claps, dancing and large movement. And also learning about controlling movement so you aren’t bumping into other people’s space. Social relations – learning to share; to apologize when accidentally bumping into another child; learning where they fit socially in the class and how to follow a leader, and then be a leader; learning how to be respectful to mommy and daddy and the teacher and everyone in the class. Small objects – oh yes, those children find the tiniest crumbs from the carpet and bring them to you with a twinkle of amazement in their eyes! There’s no wonder why Music Together is so exciting! We all get to observe the magnificence of the young child and stand in awe of the extremely complex process it is of creating the self and developing the mind in all its intricacies!